from Art to the 5th!! Get a sneak peek of her project here and then head on over to her personal blog to see how she did it along with a VIDEO! 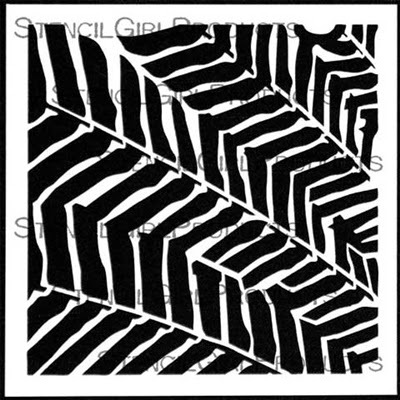 But before you leave make sure you head on to the end of this post and enter the GIVEAWAY and see about our StencilGirl SALE!!! I am in love with the Mimosa Stencil! It reminds me of feathers and I like that it has varying sizes to the leaves. It is the perfect accent stencil. Scalloped Flap Mail Art created with Mimosa Stencil and Bubbles Stencil. Visit my blog HERE for a step-by-step video tutorial on how I made this piece of mail art. The Circle Play Stencil works great when you spray ink right through it and then imprint the inky side onto another piece of paper. Play around with more than one color of acrylic and add outlines to really make it pop! Journal page created in my Documented Life Project Moleskine Planner with the Circle Play Stencil. Visit my blog HERE for a complete list of supplies used for on this journal page. Roben-Marie's mission is claiming happiness for herself and others through her rule-breaking combination of colors. Artist, blogger, designer, owner of Paperbag Studios, LLC and instructor, Roben-Marie is often either geeking out behind her Mac or painting in her Florida home studio. As a woman of faith, she believes that serving others through inspiration, encouragement and instruction is a priority. A desire to learn and an unquenchable curiosity keeps her fingers messy and her heart happy. Roben-Marie's work can be found in industry publications, art journaling books, her Etsy shop and on her blog. Her unique blending of color, elements and design makes her pieces unmistakably recognizable. Her style has been translated to canvas, journals, fabric, stamps, artist papers and most notably, mail art and Art Pops™ artist cards and accessories. With a following that regularly demands the next workshop and product line, Roben-Marie shares her joy of mixed media and inspires the artist inside every heart wondering if they have the courage to claim it. Visit Roben-Marie’s Blog HERE and check out her Workshops HERE and a host of Tutorials HERE. Thank you to everyone that has entered the GIVEAWAYS this week! The winners will be announced right here on the blog this Sunday, July 13th! Love Roben-Marie's style - so refreshingly different! Roben-Marie's style makes me think of urban graffiti....the best kind. The Mimosa Stencil is one of my favourites. Ohhh, love this mail art! Your stencils are fabulous! Whoo!hoo!!! I always love what Roben-Marie does with a stencil! What gorgeous projects! LOVE your colors!! Wow! Love those colors ! Thanks for the inspiration! Love how u used the stencils, but at the same time you can't really tell they are stencils! 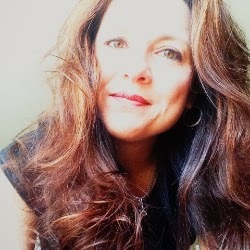 Amazing as usual Roben Marie!!!! I swoon over ALL of your work! I love both both her mail art and docoumented life page! And I also love all the stencils she used! I love the stencils, I would love to win! You have some of the absolutely BEST stencils out there! Love! FAbulous piece of mail art! Love Roben Marie's style. Gorgeous mail art and oh so fun for both you to make and the person receiving it! I'm sure the mail people enjoy it too along the way! Thanks for all the inspiration this week... lots of great ideas! This week with the DLP gals gas been great. Thanks for the chance to win. What a great project, a what an amazing week... so much inspiration! Fantastic way to use the stencils and I love the colors you used. Just took a stenciling class so I'm ready to start playing. Just needed a jump-start to get going. thanks for the chance to win great stencils. Fantastic giveaway! I would love to win! Please count me in & I did leave a comment on DLP blog to complete my entry! Thank you! Now I know what to do with that stencil! Thanks, Roben-Marie. That circle play stencil looks yummy! I love the artsy look of these stencils. I can't wait to try them in my encaustic work. Great stencils - I love the mimosa especially ! Great stencils!!! I really love the mimosa. Roben-Marie is brilliant at incorporating stencils and stamps into her work. I am dazzled by your work and the amount of art supplies on your blog. WOW, that is stunning, I love all the stencils and colors. great project. Thank you for choosing my 6"X6" Mimosa stencil as one of the tools/supplies for this breathtaking project of yours! It's a personal favorite of mine too ... especially now, when my beloved mimosa tree appears to be dying. This silhouette of its leaves will live on! I love all of Roben's work and wonderful instruction. Thanks for the chance to win and all the awesome inspiration. I'm enjoying all the projects this week and thank you for the chance to be included in your drawing. Roben your work always inspires me. I love this project. Circle play has been one of my absolute fav stencils to work with. And Roben your work does always inspire. Thanks for sharing! I love Roben-Marie's work. These stencils are wonderful! I hadn't seen Roben-Marie's work before but I'm really taken by this mail art piece! Lovely colors and terrific balance of colors and light-dark. Love Roben's color choices. 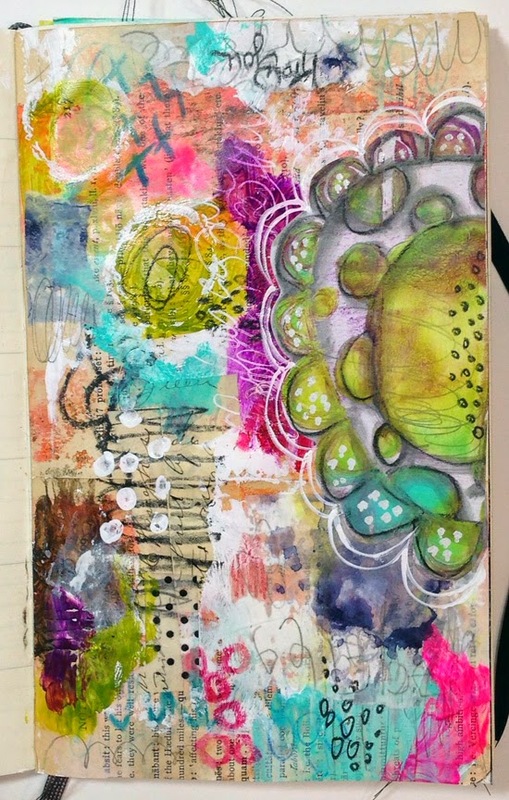 I am a fan of her art journaling and love her creativity. Thanks so much for this great tutorial!! Not sure if I should post again to enter the giveaway, but I'm posting anyway to say thanks for the tutorial. Loved it! I'm totally copying her tutorial tonight! Finally something to do with Dina's paints! Thanks so much. Love having more beautiful stencils! Oh, note to self...don't go on vacation because you miss the opportunity to win on blog hops. Maybe this will be a lucky day! Thanks for the opportunity. Looking forward to going back and seeing all the great post from this week. Robin Marie's was great. Fingers crossed! Love the stencils! Thanks for the chance to win one. 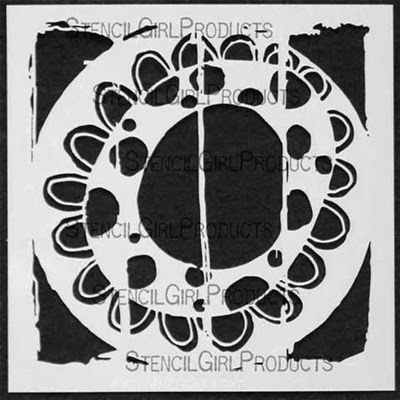 love the circles stencil and roben-marie is one of my fav artists. Christmas in July!!! Thanks for having such a great sale. Believe me, I wanted to purchase one of each. :) Wishing Mary Beth the happiest of birthdays! 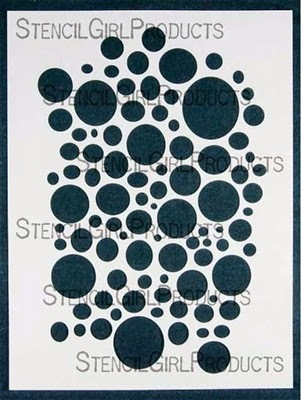 Oh Boy now that I see Roben-Marie's use of the circle play stencil, I wish I had added it to my order. Her work is always so inspiring. 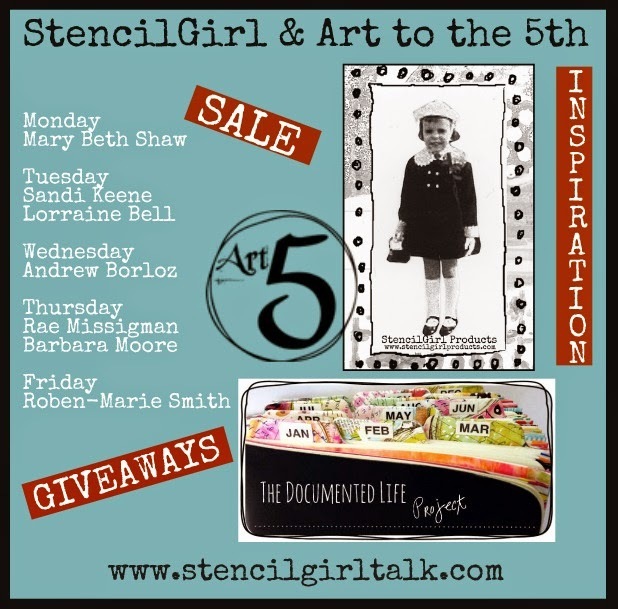 Thanks Stencil Girl for this special, giveaway, and discount. Love what you've done with the stencils especially the beautiful colors! Great to see another wonderful Roben-Marie tutorial. Always a pleasure. Thanks for having her show imaginative uses of your stencils. Such a wonderfully brilliant idea on how to use these stencils! 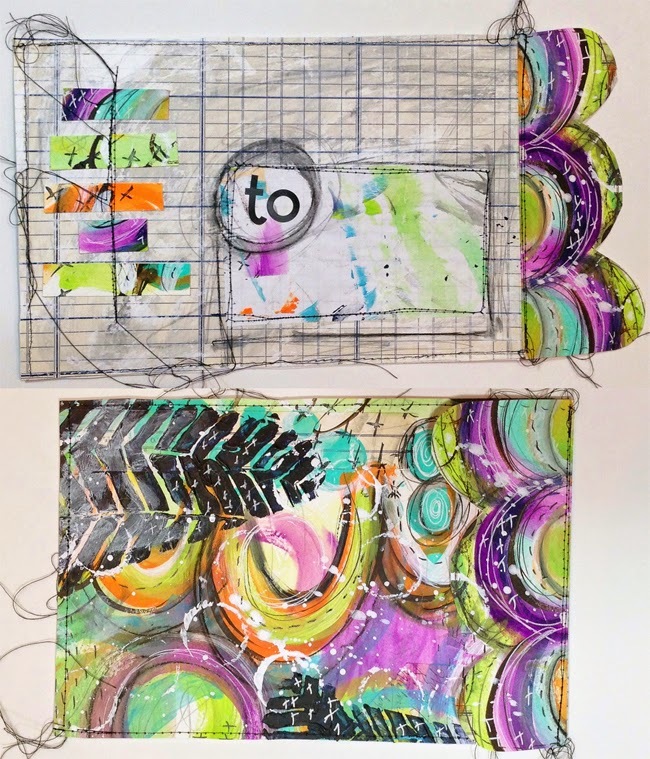 Great mail art and journal page, Roben-Marie! I really love the playfulness and spontaneity of each one. I think I missed the deadline, but must comment anyway because Robens artwork always inspires me! Love her! these are the best stencils ever i think but it's roben marie showing them of course; i'd love to give it a try myself! I just received my Mimosa Stencil and really appreciate the inspiration from you lovely art!